Chicago Zoological Society - What is a Pangolin? HomeBlogs Center for the Science of Animal Care and Welfare February 2018 What is a Pangolin? What is a pangolin? The first time most people hear the name, they mistakenly assume you said “penguin”. When corrected, most then just shake their head or say they have no idea what a pangolin is. 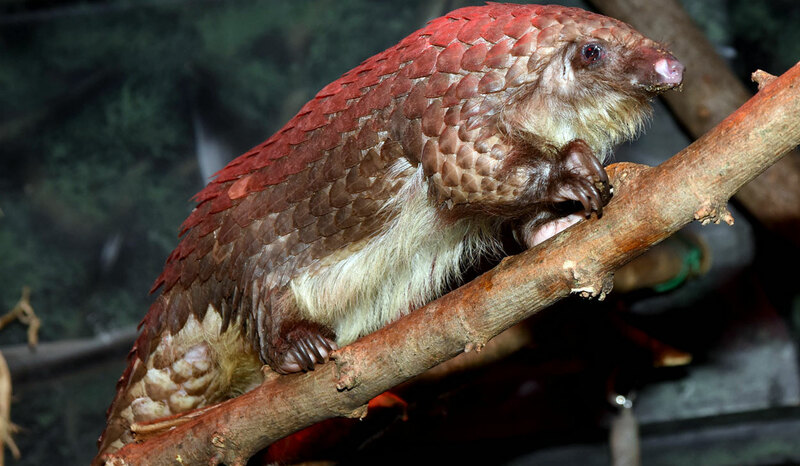 This odd-looking creature completely covered in scales may not be well known but unfortunately, they have the distinction of being the world’s most illegally trafficked mammal. And now, people are starting to take notice. Over the last ten years, millions of pangolins have been illegally poached and traded as bushmeat for consumption in Asia. In addition, their scales have been illegally used for jewelry or ground into powder for traditional folk medicines. And as a result, all eight species of pangolins throughout Asia and Africa are now facing extinction. With pangolins facing extinction within the next ten years, accredited zoos and conservation organizations around the world realized that action needed to be taken. Now. So, the Pangolin Consortium was founded to help provide solutions for the future of pangolins. This consortium consists of the not-for-profit organization, Pangolin Conservation, and six zoos from across the United States including the Brookfield Zoo. Researching animals in their natural habitat is always a key tactic when looking to learn more about a specific species, but since pangolins are secretive, solitary, and nocturnal creatures, the consortium knew that it would be incredibly difficult to study them in their natural habitat. So, working closely with Pangolin Conservation, the Pangolin Consortium decided to relocate some of the endangered white-bellied pangolins to the United States for professional care and research. The consortium then collaboratively developed comprehensive programs for understanding the basic biology of the species, for educating millions of people, and for supporting conservation actions. Pangolins are incredibly unique animals. The eight different species are somewhat similar in appearance but range in size from the size of a small housecat to as big as a beach ball along with a tail. They are completely covered in scales that are made of keratin, which is the same as human fingernails. Their scales take up about 20% of their body weight. And they use an extremely long tongue that’s covered in a sticky saliva to catch their nightly intake of termites and ants. Caring for these animals in a zoo environment is a delicate process so the Pangolin Consortium began a new program that included developing an elaborate but tasty diet and creating comfortable, natural surroundings. At Brookfield Zoo, knowing that pangolins are solitary animals, our 11 African white-bellied tree pangolins have been given their own specially outfitted rooms. Pangolins are extremely sensitive to their environment so we made sure they were as comfortable as possible. White-bellied tree pangolins live in the moist tropical lowland forests in central to West Africa, where the humidity and air temperature are warm. So we worked to ensure the room temperature was kept at 75 degrees and the humidity at 60%. We started feeding the pangolins a diet developed and recommended by Pangolin Conservation. This “meal plan,” developed through years of research with assistance from experts, veterinarians and animal nutritionists, ensures that the pangolins were receiving the proper amount of vitamins and nutrients they needed. Their favorite foods in the wild are ants, termites, and insect larvae, but we had to find good tasty substitutes that now include mealworms and fly larvae. These insects are all significantly high in nutrients. The insect larvae are ground up and mixed with other nutritious ingredients to form a cake. Keepers feed the pangolins a measured amount of this special cake twice a day. Before each new feeding, the keeper weighs any food that remained from the previous feeding to ensure the pangolins are eating enough. In addition the pangolins often receive dried ants sprinkled on their meal as added flavoring and nutrition. Pangolins live in burrows in the wild so keepers added we provide natural materials including hollow logs and large soft bedding materials in each of their rooms. Keepers have been delighted to see that all of our pangolins love to snuggle into their bedding and enjoy burrowing deep into their hollow logs. With the goal of conservation through understanding, the Pangolin Consortium is now working to better understand their reproductive physiology, diseases, and behavior, as well as support rehabilitation efforts and field research. The pangolins that are currently residing with the Pangolin Consortium members are doing extremely well and are thriving under professional care. In fact, there have been a number of pregnancies and births including some conceived within the care of members. In addition to the conservation efforts taking place here in the United States, the Pangolin Consortium is also working with zoologists and students from the University of Lomé in Togo, one of the West African countries where the white-bellied pangolins live, to create and strengthen conservation efforts there as well. A staggering 175 million people visit zoos each year, allowing zoos and aquariums the incredible opportunity to educate millions of guests about endangered animals, like pangolins. Most people in North America don’t know what a pangolin is and don’t understand the serious threat to this endangered animal’s survival. But organizations like the Pangolin Consortium, the Pangolin Conservation, and Brookfield Zoo are dedicated to educating visitors, supporters and members about this highly trafficked mammal, with the hope of safe guarding this species from extinction.